The earth neither grows old or wears out if it is dunged. – Columella, circa 45 A.D.
Organic fertilizers differ from chemicals, in that, they feed your plants while building the soil’s structure. Soils with lots of organic material remain loose and airy, are better able to hold moisture and nutrients, foster growth of soil organisms, including earthworms and promote healthier root development (see Soil Fertility & Crop Nutrition). Building a healthy soil is the key to successful organic gardening. Another advantage of organic fertilizers is that they are made from plant and animal sources, or from rock powders. These materials need to be broken down by soil microbes in order for their nutrients to be released and that takes time. Because organic fertilizer works slowly, it provides long-term nutrition and steady, rather than excessive growth. 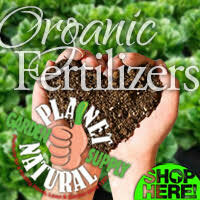 Looking for natural and organic fertilizer to ensure a beautiful, healthy crop? 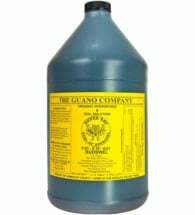 Planet Natural offers a large selection of guanos, liquids and dry formulas, plus specialty plant supplements at great prices. Please check them out! On the other hand, chemical fertilizers work fast which is a good thing, if that’s what you’re looking for. They can make a bad garden or lawn look good much quicker than most organics can. However, it’s my opinion that the nutrients are released too quickly, creating a great deal of top growth before the roots are able to catch up. This kind of growth often leads to weaker plants. Also, because they are so rich, synthetic chemicals can easily be over applied and “burn” roots or create toxic concentration of salts. Learn more about the adverse effects of chemical fertilizers here. Chemical fertilizers will not improve the structure of the soil. In fact, because they are composed of high concentrations of mineral salts, they are capable of killing off many of the soil organisms that are responsible for decomposition and soil formation. If only chemicals are added, the soil gradually loses its organic matter and microbiotic activity. As this material is used up, the soil structure breaks down, becoming lifeless, compact and less able to hold water and nutrients. The result is pretty clear – you’ll have to use more and more fertilizer. Organic fertilizers fall into two categories: dry and liquid. Dry fertilizers such as bone meal, rock phosphate, bat guano and blood meal are solid food for your beneficial soil microorganisms. 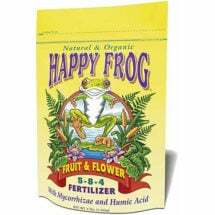 They feed on it slowly and provide valuable nutrients to your plants throughout the entire growing season. Visit the National Soil Survey Center (NRCS) for more information about the mix of living organisms in the soil (PDF) here. Perfect for every plant in the garden! 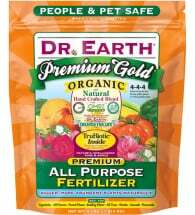 Dr. Earth® Premium Gold All Purpose Fertilizer releases its balanced plant nutrition quickly, yet continues to feed for several months. Promotes healthy growth and bigger, more abundant harvests… NATURALLY! 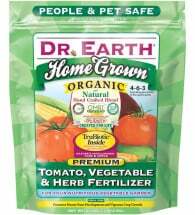 Each 4 lb bag will feed 60 square feet or 16 five-gallon plants. In most cases, dry fertilizers are broadcast directly over the top of your garden and are then hoed or raked into the top four to six inches of soil prior to planting. 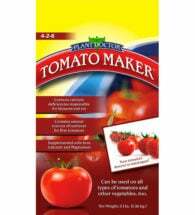 You can also add small amounts to planting holes as you sow seeds or transplant plants. Another way to use dry fertilizers is to mix them along side plants during the growing season. This method is called side-dressing and works best if you can mix the fertilizer into the top inch or two of the soil. Unlike dry synthetic fertilizers, most organic fertilizers will not harm the delicate roots of the plants. Liquid fertilizers are less concentrated than dry and are to organic gardening, what PowerBars are to athletes — a light nutrient boost for maximum performance. 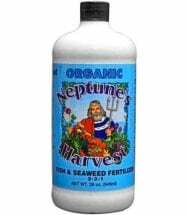 Fish hydrolysate and kelp extract are two common kinds of liquid organic fertilizer. The most common method of delivering liquid fertilizers to plants is through their roots – by watering or root drench. Foliar feeding, an alternate method, delivers nutrients through the foliage or leaves of plants. Up to five hundred times more effective than soil drenching. 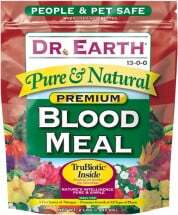 Nutrients are taken up immediately by plants, so you see quick results. Supplies elements, such as iron, when they are not available in the soil. 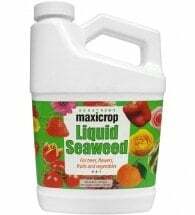 Liquid fertilizers are often used to help plants during critical periods such as blooming, after transplanting, during fruit set or during periods of drought or high temperatures. Some experts recommend applications every month — or every two weeks — during the growing season. The best times to apply foliar sprays is early morning and early evening when liquids will be absorbed quickly. To correctly use any fertilizer, always make sure to apply as directed. The three main nutrients that have been identified as absolutely necessary for plants are nitrogen (N), phosphorus (P) and potassium (K). These three are also known as macronutrients and are the source of the three numbers commonly found on fertilizer labels. 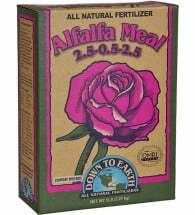 If you’re looking to see bigger blooms and healthier soil in your garden, Down To Earth® Alfalfa Meal is one of our top choices. 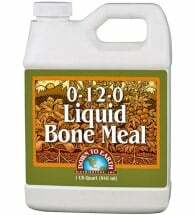 This all-natural soil additive provides trace elements, natural growth accelerants and beneficial organic matter. Nitrogen (N) is responsible for above-ground vegetative growth of plants, and for overall size and vigor. It is probably best known for its ability to “green up” lawns. That’s because nitrogen is a major component of chlorophyll, the green substance in plants responsible for photosynthesis. Nitrogen can be added to your soil through blood meal, alfalfa meal and fish meal. Too much nitrogen and your plants will grow extremely fast, resulting in long, spindly, weak shoots with dark green leaves. Too little nitrogen and your plants will slow or even stop their growth and have leaves turning yellow and dropping sooner than they should. Phosphorus (P) promotes healthy growth, strong roots, fruit and flower development and greater resistance to disease. Rock phosphate, bone meal and some guanos are sources of phosphorus. A phosphorus deficiency is recognized by dull green leaves and purplish stems. Plants are generally unhealthy, sometimes yellowing. Lack of blooming with lush green foliage may also indicated a lack of phosphorus. Potassium (K), also known as potash, is essential for the development of strong plants and overall plant vigor. It helps plants to resist diseases and protects them from the cold. Because potassium plays a supporting role, it can be hard to spot deficiencies. Generally, leaves will show blue, yellow or purple tints with brown blotches or discoloration within or at the edges. Plants will lack growth and have small fruit and sickly blooms. Sources of potassium include greensand, sul-po-mag (sulfate of potash magnesia) and many liquid fertilizers. 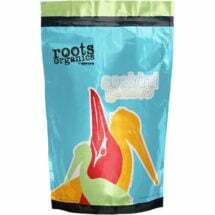 Encourages healthy root systems, large bud set and multiple branching. Fast acting with high phosphorous numbers to encourage huge blooms.